This large albumen photoprint appears to show the Reverend William Cuthbertson (seated) surrounded by the five prominent Sydney businessmen who were deacons of the Pitt Street Congregational Church, but these gentlemen did not actually pose for this group photograph at the same time. The photograph is in fact a montage of three or four separate images, joined together, re-photographed and then hand-coloured to complete the illusion. 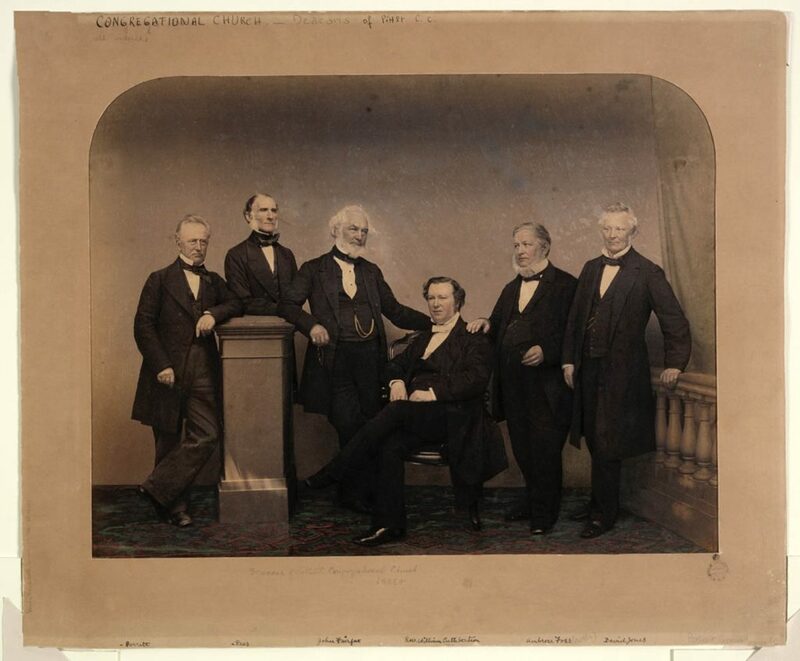 The subjects of this group portrait are from left to right: auditor Robert Garrett (d.1876), merchant George Rees (d.1862), newspaper proprietor John Fairfax (1804-1877) leaning on a square plinth, the Rev. Cuthbertson (ca.1827-1910) seated, grocer and druggist Ambrose Foss (1803-1862) and draper David Jones (1804-1877) standing next to the length of balustrading. Almost all of the men are dressed in customary mid-19th century business attire, namely double-breasted black [wool] frock coats with wide notched lapels, several with wide deeply-cuffed sleeves, worn over dark trousers (Robert Garrett’s with turned up cuffs), waistcoats draped with gold fob chains and starched white shirts with high peaked collars, encircled by dark cravats tied in a flat bow. The Rev. Cuthbertson wears a white tie to denote his status as a member of the clergy. John Fairfax wears a signet ring and Ambrose Foss a morning coat, perhaps better suited to the portly physique of this importer of epicurean delights, which ‘for excellence of taste and flavour, being in high condition, can scarcely be equalled in the Colony’. The men all wear square-toed dark leather shoes, with varying degrees of polish, and several hold spectacles. All have longish hair with left or right side partings, brushed back from their foreheads and curling over their ears, and clean shaven cheeks, some retaining side whiskers or a fringe of beard around the chin. In 1861 German-born photographer William Hetzer imported one of the colony’s largest cameras, enabling him to produce large group portraits photographs like this. Within 12 months of the taking of this photograph, however, two of the deacons (Rees and Foss) had died and their pastor had returned to England. The Pitt Street Independent Chapel had opened for worship in 1833, with a congregation comprising twelve members. In 1840 the first pastor, Reverend Robert Ross (1792-1862), arrived with his family to commence his ministry. By 1841 the Chapel was inadequate for the growing congregation, and a new church building was constructed on the site of the present Pitt Street Congregational Church opening in 1846. Following the retirement of Pastor Ross due to illness in 1854, the young Dr Cuthbertson was invited to Sydney to take up the pulpit at the Pitt Street Congregational Church. John Fairfax (1804-1877) migrated to Sydney with his family in 1838, joining the diaconate of the Pitt St Congregational Church in the same year as Welsh-born David Jones, who would serve 35 years as a Pitt Street deacon; Jones’ eldest daughter Eliza married Robert Ross, son of the first pastor, in 1849. Along with Robert Garrett, Ambrose Foss (co-founder of the Congregational Church in NSW) and George Rees, this network of energetic nonconformist businessmen would grow together in wealth and influence in the colony, closely associated through chapel, commerce and civic responsibility. William Hetzer and his wife, Thekla, arrived at Sydney on 3 February 1850, and began operating their photographic studio in Hunter Street, before moving to George Street (1850 –1867). Hetzer seems to have always specialised in paper photographs and was best known for his wet-plate collodion negative albumen prints of Sydney streets and buildings, in particular a series of up to 60 stereo views of the city which he was producing by subscription in 1859. Hetzer also submitted a large (46” × 24”/ 116.8 × 60.9 cm) coloured composite photograph of the 23 officers of the Sydney Provincial Grand Lodge of Freemasons to the 1862 London International Exhibition.